There are times when you can learn to do something right by initially doing it wrong. And then there are times when you think you’re doing something right, but you’re actually doing it wrong, and therefore you don’t learn a thing. This second sentence may best describes most folks who design, construct, and maintain hiking trails in the Northeast. Well, it’s high time to tell them, for the sake of everyone, that they’re doing it wrong. 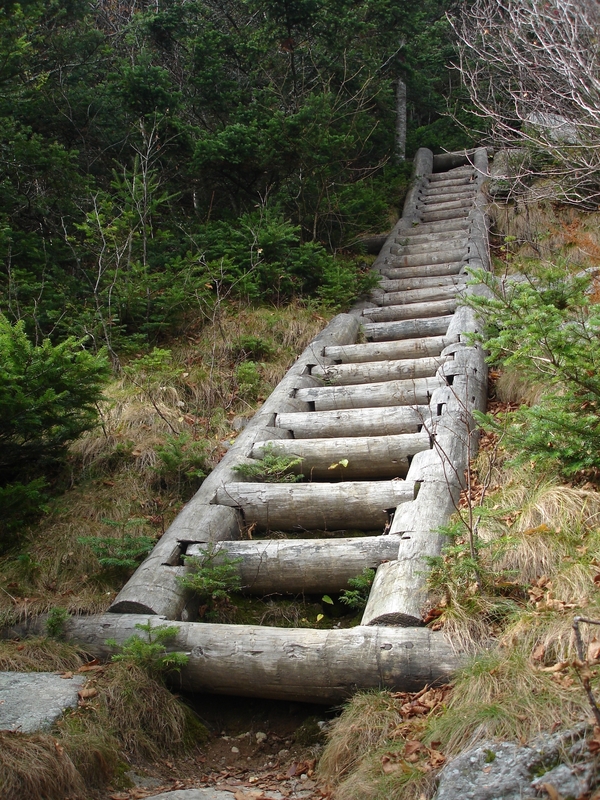 My first trails job was in White Mountain National Forest in 2001, and during the decade that followed I designed and built trails, and taught others how to do so, in the Northeast and the South. 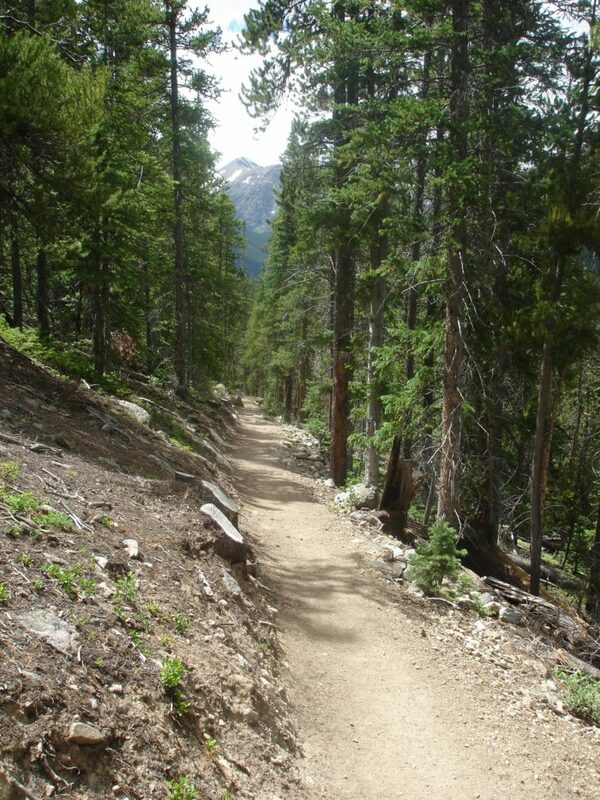 During that time I also hiked and mountain biked hundreds of miles of trails in the American West. They say it’s all about location, location, location, and this is true when it comes to how trails are designed and built. You see, as I came to learn, trail builders of the Northeast consistently break the five rules of sustainable design and construction. Average trail grade does not exceed ten percent. Trail grade does not exceed half the angle of the slope it’s built into. All spongy organic material is removed to expose durable mineral soil. No water bars are used—employ grade reversals (the trail countlessly alternates between running uphill and downhill for short stretches). Trail possesses a ten percent outslope (the trail tilts towards its downhill edge). 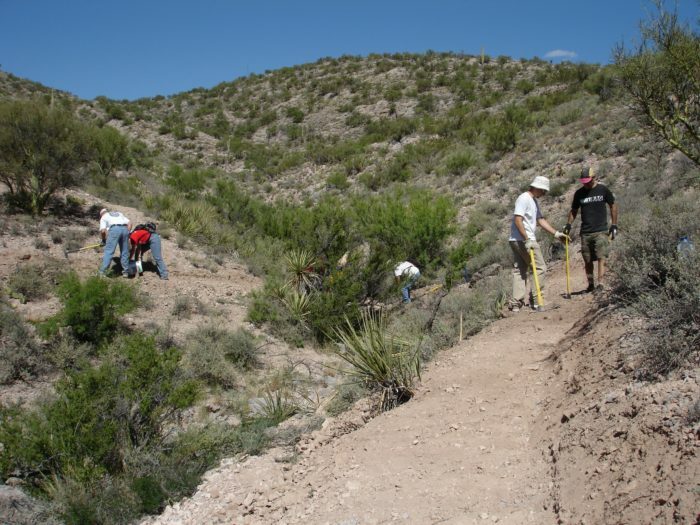 When trail builders don’t follow these rules, they invariably end up subscribing to a seven-step process that results in forcing trails up and down steep slopes, which leaves hikers careering down trails so eroded that these pathways resemble streambeds with trail markers. In addition to providing users with an unenjoyable trail experience, this process in turn breaks the twofold goal of trails, which is to keep water off and keep hikers on. This seven-step process is flawed and costly. Clear a corridor straight uphill through the forest. Wait a few years for the trail to turn to mud and then erode. “Harden” the trail by installing features such as rock steps. Install water bars to help guide water off the trail. Notice that erosion has not been stopped. Install more hardened features and water bars. 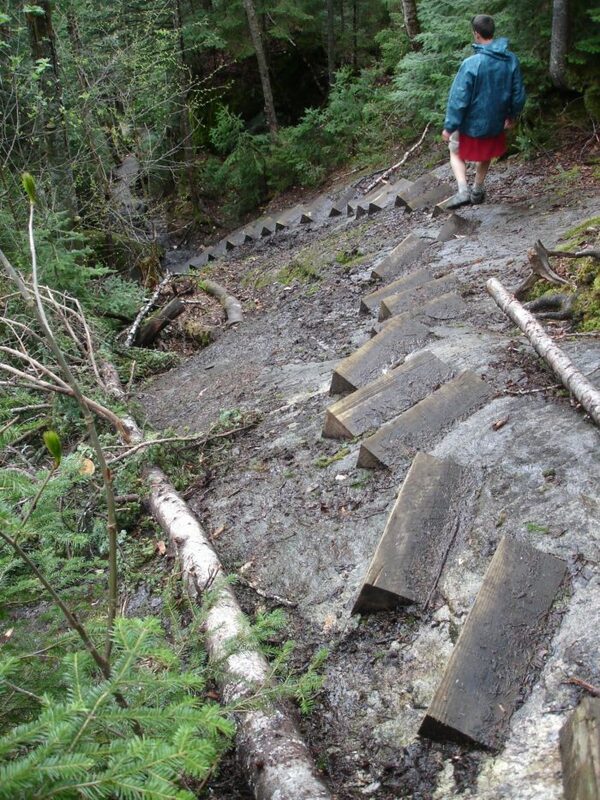 Keep cleaning displaced sediment out of ineffective water bars and blame hikers for the degradation of trails. I take personal issue with step No. 7 because I’m a hiker who has grown frustrated and tired of people blaming me, my fellow hikers, and “overuse” for the disgraceful condition of Northeast trails. I assure you we’re innocent. The three forces that degrade trails are erosion, displacement, and compaction. Hikers cannot commit the first force, and they commit the other two at negligible levels. The only thing on earth that erodes trails is erosion, a force that can only be sourced from snowmelt and precipitation. Displacement is the act of moving soil, the worst-case scenario being moving it off the trail. Two examples of high-displacement sources are ATVs and downhill mountain bikes, which have aggressive knobby tires that grip and then fling soil. The treads on hikers’ boots can’t displace much, and since most long-distance hikers now wear trail runners, human-powered displacement is even further reduced. Compaction is the tamping down of soil. Once a trail is packed down to a level lower than the forest floor that hems its two sides, water can’t get off it, and it becomes a drainage. A high-compaction source is a horse, which on average weighs 1,200 pounds but whose weight is dispersed by two square feet worth of hooves hammering the trail. Your average hiker, with pack, is only about 200 pounds, and this weight is dispersed by a square foot worth of soles gently contacting the trail. Someone who’s apt to blame hikers for compaction sets aside time in their day to demonstrate a lack of mathematical comprehension. They’ll say something like, “But if ten 200-pound hikers walk down a trail, that’s one ton of force compacting the soil.” No. It’s not. It’s ten separate applications of 200 pounds. Clinometer for measuring the grade of your proposed trail. Chainsaw for clearing a corridor. Aggressive cutting and digging tools for removing stumps. Digging tools for removing organic material. Rock bars for moving big rocks. Coal bags for transporting material. Sledgehammer for bashing pointy rocks or making durable fill. Loppers for snipping small remaining roots and stumps. Digital level for measuring outslope. Leaf rakes and gravel rakes for giving the trail a smooth finish. It’s usually not best to conclude facts with an inquiry, yet I can’t help but conclude this crash course in sustainable design and construction with a fair question. That is, if you’re a Northeast trail builder, who knows that unsustainable trails provide lousy user experiences and are expensive or outright impossible to maintain, and that sustainable trails provide outstanding user experiences and require minimal maintenance, why are you still thinking about building your next trail straight uphill? So much this. So much. Thank you. I did the 100 mile wilderness and was angry at the horrible trail building decisions made – at one point we were literally hiking in a six-inch deep stream up straight up a hill with no direction changes until the crest. It wasn’t a trail, it was a streambed. But to be fair the comparison between the Northeast which gets 40-50 inches of rain a year (Providence is already over 50″ for 2018) and two sustainable trails in CO and Arizona which get dramatically less rain, and therefore don’t have to account for water management in the same way. I’d really like to see more examples of sustainable design high rainfall places, especially on high-volume use trails like the AT/Long Trail. Thanks for your non-jerky comments, Jerky. I recently thru-hiked the 240-mile Trans Adirondack Route, and my feet were soaked for 200 of those miles due to ineffective drainage on the trails, some of which were truly streambeds with trail markers. Please share this article with anyone you know who has anything to do with trails. Thanks, very well written. Come back with the long version anytime. Thanks for your single comment, Triple Dip. I used to present the very long version. When I taught at a college in Upstate New York I designed and then taught a 200-level course, Sustainable Trail Design and Construction. Great stuff. Please share this article with anyone you know who has anything to do with trails. This needed to be said and I’m so glad someone finally said it! I’ve been complaining about northeastern trails since the first time I hiked in the northeast two years ago. I mostly hike in the rainforest that is Western North Carolina, so we get a ton of rain and the higher elevations get snow every year. I won’t say the trails down here are perfectly designed, far from it. But I have noticed that in sections of the trail where past poor design has lead to the need for a reroute or rebuild of entire trail sections, I’m seeing more and more sustainable trail design. Like the example you made above in GSMNP. 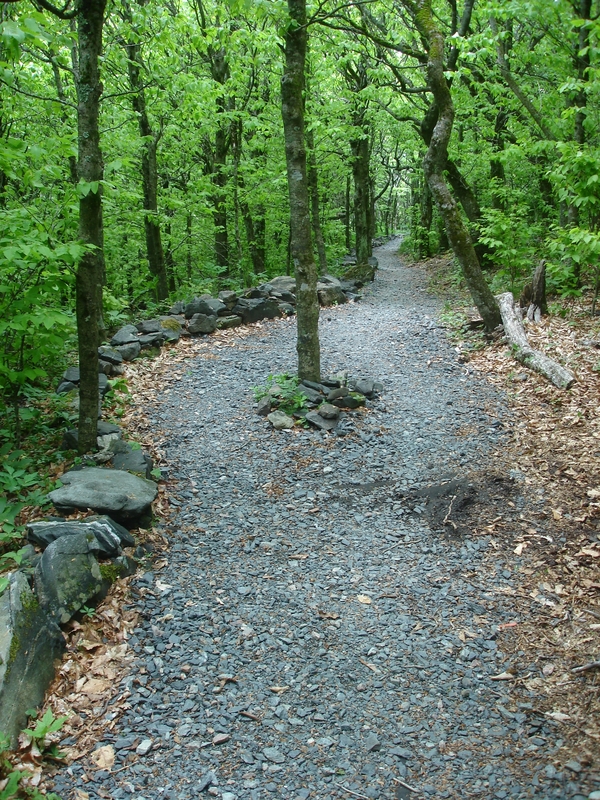 The AT through the National Park used to look a lot like the northeast trail (straight up the side of a mountain, eroded down to rocks and roots). Those trail segments have been abandoned and the AT has mostly been re-routed along a gentler grade and more sustainably built footpath. Thanks for shedding light on this issue. Thanks for your comment, Stacia. I have hiked a lot in the South and can appreciate what you see between there and the Northeast. 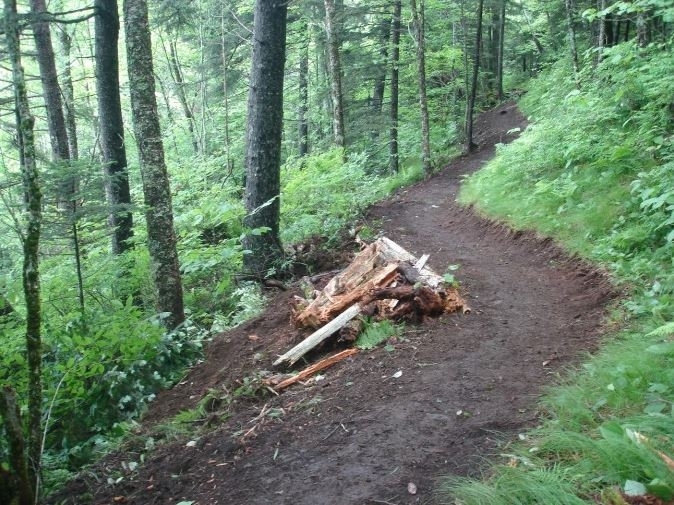 That trail in the Great Smoky Mountains National Park image — built by yours truly. Problem is, most folks in the Northeast, especially in the Adirondacks, won’t even talk to me about sustainable design. Understandably, people don’t like to hear that they’re doing something wrong, so they tend to tell themselves its alright. Please share this article with anyone you know who has anything to do with trails. Wow, I had no idea. I grew up hiking the Whites and live there still. 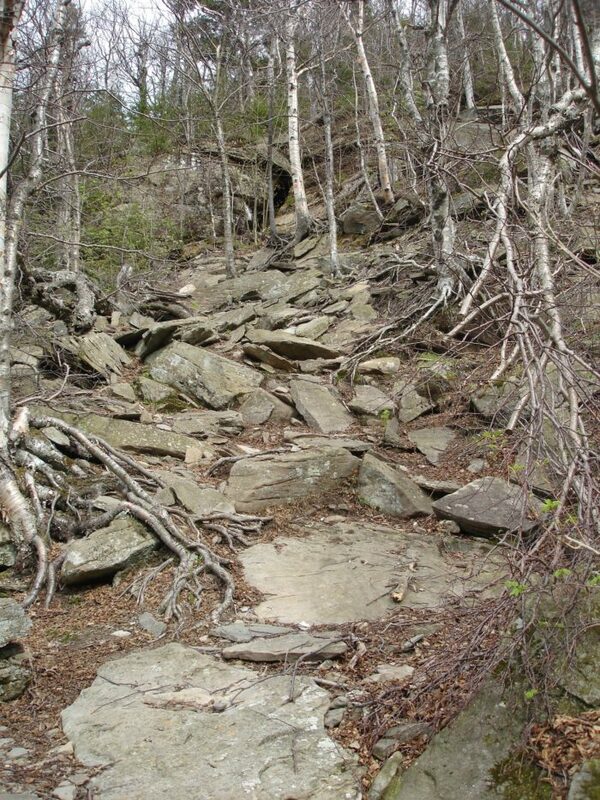 I just kinda assumed that straight up and eroded was the way the trails here had to be. On the AT/LT in VT, I thought. “Huh, guess it’s just really wet here, that is why the trail is often a river or a bog, even in a drought year.” I would love to see what another way looks like. Can you think of any trail/trail sections in the Whites that are sustainable built? On the other hand, the steep, rock scrambling nature of the hiking here is part of what makes the experience here so great. While I’m all for graded, gradual switchbacks in many areas if it preserves the treadway; I think something would be lost if Mt. Washington’s Huntington’s Ravine Trail or the steap middle section of the Hunt Trail on Katahdin were changed to abide by rule 1 and 2 of sustainable trail design. Do you think that iconic trails such as these should be treated differently and be given a pass, just like the Ford Model A hot rod that we let on the road with a special plate despite the cloud of noxious emission billowing from its tailpipe? Thanks for your comments, Steve. Before I became a trail builder, I was wholly ignorant of if trails were “bad” or “good.” They were steep, rocky, rooty, and muddy, and I just thought that was the way the world worked. The only trail I can think of in White Mountain National Forest that’s sustainable is the one that runs below Whitewall Mountain (it may be the AT). That’s because that trail is an old railroad bed. The sustainable design rule is that the trail’s average grade should not exceed ten percent. Logging railroads’ maximum grade was three percent. I’m just fine with there being “special” trail are are gnarly and very challenging. But most trails would best be built sustainably to offer great user experiences and minimal maintenance costs. If you haven’t hiked in the South or American West much, you’re in for a treat. Many trails are mellow enough and smooth enough to ride a ten speed down. Please share my article with anyone that comes to mind. Very well said….now if we can just get the proper people to READ IT !!! I doubt I could agree more, Scott, and this is a great opportunity to share this article with anyone you see fit. Folks generally don’t like being told they’re doing something wrong, especially when it was a long project such as building a trail. Ego sometimes trumps erosion. For such an important article, it’s been shared directly from The Trek only five times. Thank you for your kind comment, Phoebe. Shout it from the hilltops! And share with anyone you see fit. Having hiked, both with day pack and with overnight pack, many trails in Connecticut, Massachusetts, Vermont, New Hampshire, Maine and New York I am guessing that some of the problems are: 1) In all likelihood the trails in the northeast were built well before trails out west were built 2) Once the trail was built it probably took 200 people hours to repair vs 1,000 people hours to relocate 3) The old “I hiked the AT when it required hiking ability not the new easy AT” attitude. 4) The only way to get from down here to up there is to go straight up 5) It is more fun, challenging, etc. to go straight up. 6) etc. I would like to see more sustainable trail just so I wouldn’t have to see the terrible scarring that poorly designed trails lead to. Thanks for your comment, John. There was nowhere near enough space in my article to get into it, but sustainable versus unsustainable trail design stems from two things: modes of travel and culture. Regarding modes of backcountry travel during the 1700s and 1800s, in the Northeast it was the canoe. In the South and American West it was the horse. Therefore, trails in the South and American West were graded for safe horse travel (in the South they called them “bridle paths”). When it comes to culture, people in the Northeast are hectic and like to get things done as quickly as possible, even if it means going back later and fixing what they did wrong in the first place. In the South and American West, it’s a more relaxed culture in which people take their time. These two aspects set the tone for the following centuries. But Northeast trail builders can’t, in good conscience, cite these two things for why they build trails straight uphill nowadays. It’s simply inexcusable. Thanks for the article, very well said. While there are definitely cultural and historical factors that lead to the location of NE trails, let’s also consider the labor force and land base that was/is available. In the NE, trails were build long before sustainability was even considered a desirable trait (and often, initially, on private lands). The object was to get from A to B or bottom to top as directly as possible. 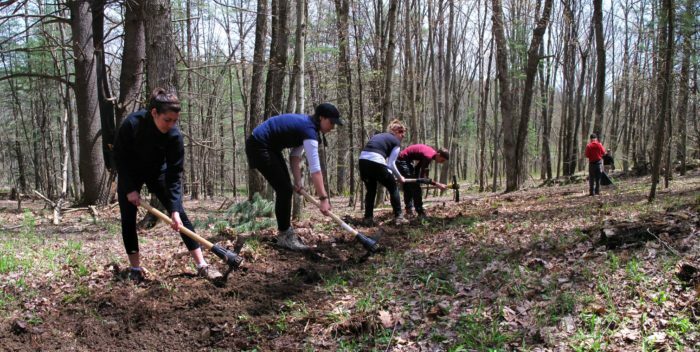 The idea of conserving natural resources was not common, and no labor resources were allocated other than volunteers of varying experience and skill level, led long before professional trail builders were on the scene. Also in the NE the available land base is pretty minimal, there was, and is not now, sufficient acreage to build trails on an appropriate and sustainable grade. The rocky nature of the underlying subsoil is also a challenge, particularly at higher elevations, there’s simply no soil (mineral or otherwise) to create a sufficiently wide bench. Unless there comes a time when there’s sufficient political will to acquire more protected land for wider trail corridors and fund professional crews, we’re pretty much stuck with what we’ve got. At present, when significant reconstruction or relocations are considered, the first choice is to find sustainable grades–however more often than not, the land base is simply not there.